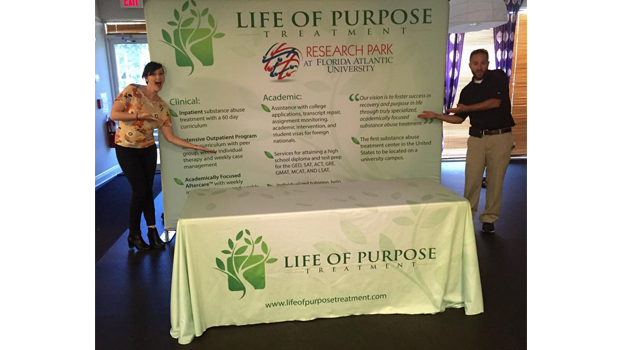 Life of Purpose Treatment is a recovery program located on several university campuses throughout the United States. 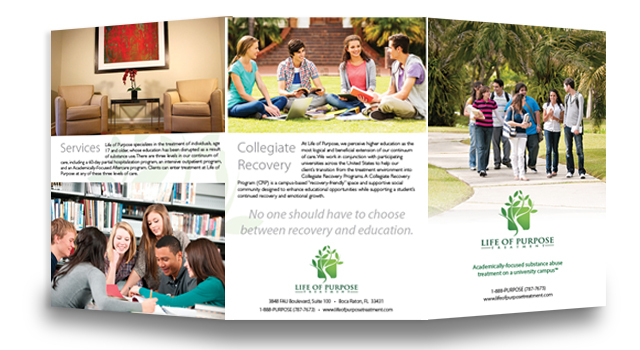 The program provides treatment and support to individuals who are pursuing an education. 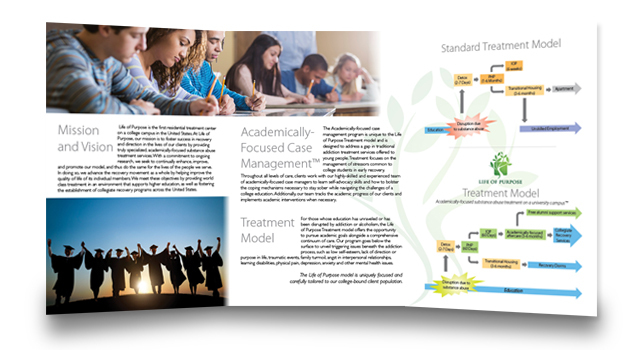 Outreach and marketing pieces depicted include a brochure, conference display, preliminary website redevelopment diagrams, and print ads. 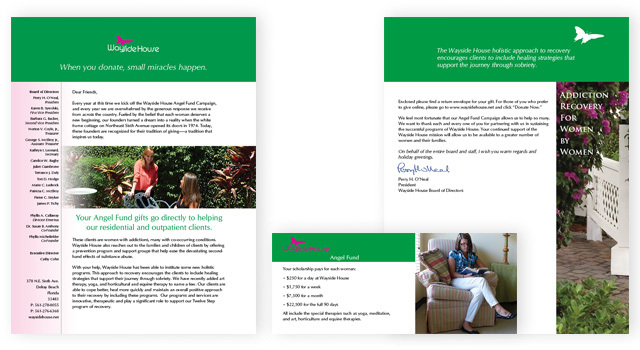 I’ve had the opportunity to collaborate with Caren on many projects over the last year. Caren is incredibly organized, timely and thorough. Several times, I’ve given her a challenging deadline or last minute project. She is always able to deliver a high quality of work. Additionally, Caren is kind, engaging, intelligent and creative. She’s truly a joy to know and work with. 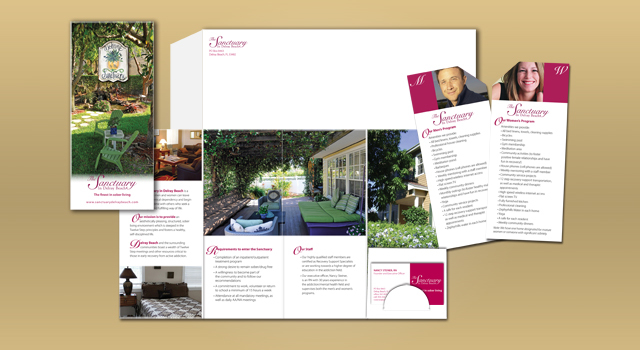 I highly recommend Caren for any design or creative project. 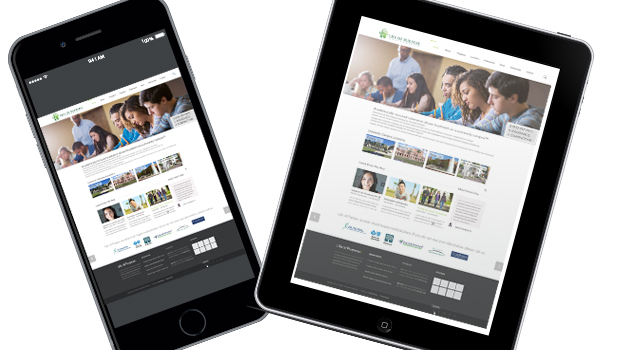 I have been working with Caren on a professional level for about 5 months. 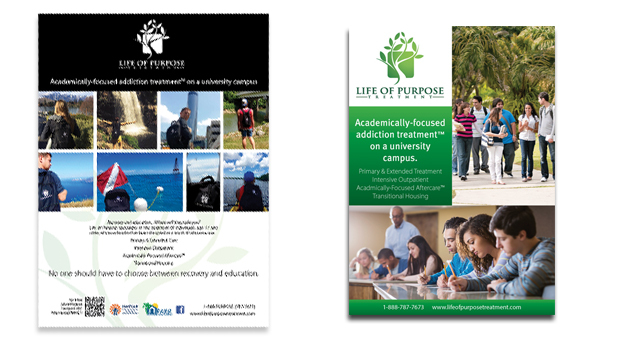 She has been the sole creative behind nearly all of the design work we have done as a company. We have asked a lot of her in that time period and she has continued to deliver time and time again. Our communication is constantly asynchronous due to the nature of my job. Caren has always followed up with me to make sure that the work I ask of her is done right and in a timely fashion. Caren has been able to work with our deadlines and has the ability to complete tasks with little direction. Her ability to produce exactly what I want based on brief conversations is one that is treasured when seeking a designer. She has the ability to piece together my loose thoughts and will deliver what I need, in the medium that I need, at the time that I need it. I highly recommend her. I designed a butterfly icon that appeared to be taking flight to reflect the spirit of optimism and strength of the recovery process. To honor the “For Women By Women” portion of the tagline, the icon is constructed using two female profiles face to face. I crafted the lettering from a typestyle called “Pump” in order to eliminate all hard edges. 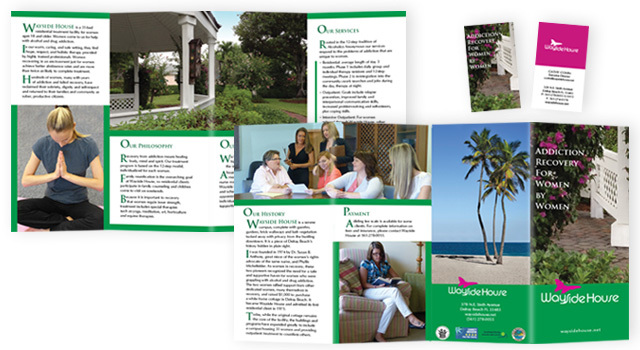 The color was inspired by the blooming bougainvillea that grow on the gazebo in the Wayside House garden. 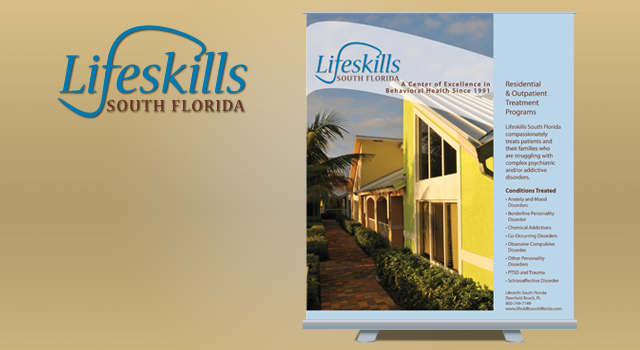 When Lifeskills South Florida, a residential mental health facility, opened its campus in Deerfield Beach, a new logo and collateral materials were designed to launch marketing efforts. 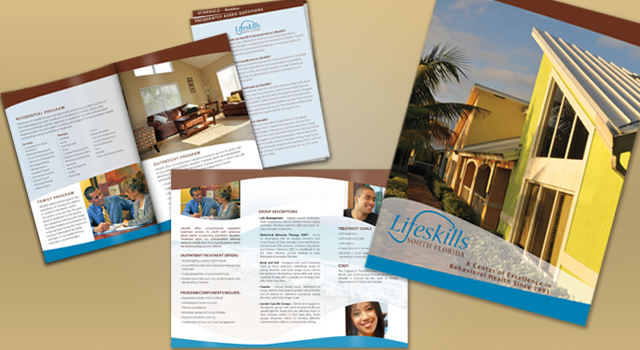 Scope of work included logo design, photo shoot art direction, pocket brochure with step sheets, presentation folder, outpatient tri-fold, banner stand, and additional items, not pictured. 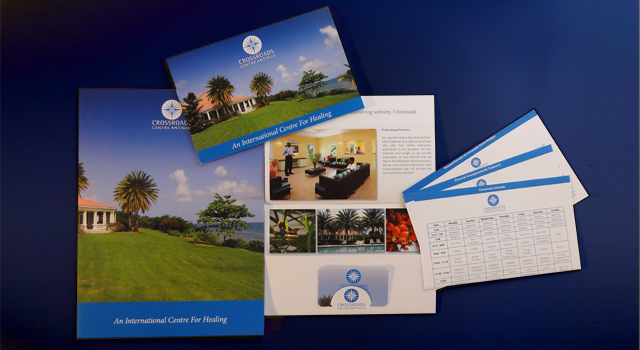 The Palm Beach Institue is a drug and alcohol addiction treatment facility.